Description: Chile. Miniature Map. Coloured. 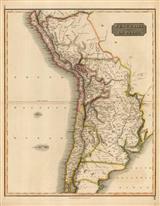 Description: Early map of Chile. Original hand colour. 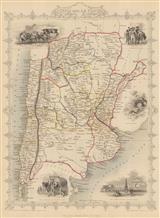 Description: Miniature map of Chile, Argentina, Uruguay, and Paraguay. English descriptive text on verso. Coloured. Description: Chile, Argentina, Patagonia and Paraguay. A large, detailed map with wonderfully ornate cartouche and original outline colour. 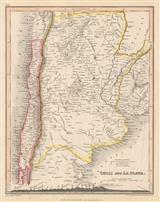 Description: Large and detailed map of Chile. Original colour. Description: Chile and Argentina, with part of Bolivia, Paraguay and Uruguay. Coloured. Description: Charming map of modern Chile and Argentina adorned with several vignettes including the Grand Square of Buenos Aires, a water seller and a rattlesnake. Original hand colour. Description: Detailed map of Chili and La Plata with settlements marked according to their populations. Cross section of A-B line at the base of the map. Original colour. Description: Southern Andes showing the route of Don Guillermo Cox and the boundaries of the Colony of Llanquihue. Original outline colouring. 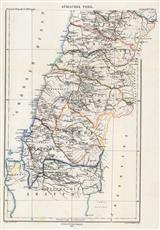 Description: Detailed map of Central Chile following the coastline from Concepcion, north to Pichilemu. Original colour. Description: Unusual map of the Chilean seaport Valparaiso. Soundings are marked across the bay. Printed colour. 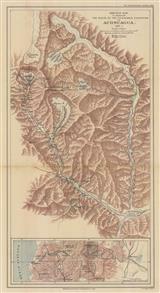 Description: A map illustrating the route taken by the expedition led by Edward Fitzgerald, which was the first to reach the summit of Aconcagua, the highest peak in the Andes, situated in Chile. Printed colour.